New Hall, Horsham. 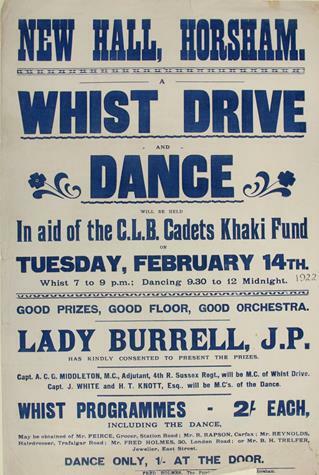 A Whist Drive and Dance will be held in aid of the C.L.B Cadets Khaki Fund on Tuesday, February 14th . Whist 7 to 9 pm; Dancing 9.30 to 12 Midnight. Good prizes, good floor, good orchestra. Lady Burrell, J.P. has kindly consented to present the prizes. Capt. A. C. C. Middleton, M.C., Adjutant, 4th R. Sussex Regt, will be M.C. of Whist Drive. Whist programmes – 2/- each, including the dance, may be obtained of Mr. Peirce, Grocer, Station Road: Mr. R. Rapson, Carfax: Mr. Reynolds, Hairdresser, Trafalgar road: Mr. Fred Holmes, 30, London Road: or Mr. B. H. Trelfer, Jeweller, East street. Dance only, 1/- at the door.